There are pitfalls or distractions associated with each of the steps of the NVC process. They’re like dragons which guard the stations that we pass through on our journey to a new land called Connection. Our dragons can appear to be formidable, but here’s how to play the game and get past them all! We start off in the darkness and isolation of the Dungeon of Disconnection in which we seem to be imprisoned. Our escape from here is often delayed by the talkative Story Dragon. The Story Dragon has a very long tail or tale and wants to tell us all the details, including how badly he has been treated and what everyone else did wrong. Usually his stories include plenty of analysis and conclusions, even if not consciously. The words ‘can’t’ and ‘have to’ probably feature, and he’s so occupied with his history that it’s heard to bring him into the present reality. So if we listen too much to this dragon, we end up simply staying in the Dungeon. As soon as the story starts to get boring, I recommend cutting it short. Ask him instead to tell you what the problem is – in no more than two sentences! While the Story Dragon is still reeling from the surprise of being interrupted, you can climb out of the dungeon and begin the journey back to Connection. Soon you come to a turn in the road as it rises up out of the valley, offering a nice clear view back to the scenery just behind you. Or it would do, if a bulky dragon wearing dark glasses was not standing in the way. This is the Assumptions Dragon, who blocks our ability to make a clear Observation. Whenever we mix our interpretations and opinions with our memories of events, the Assumptions Dragon is present. He’s confused, and so will we be if we listen to him! Ask him to take off his dark glasses and look at the bare facts of the matter. If necessary, ask him to look at the roadside security camera to get a reality check. Then you can make a clear description of ‘what is’ – without any filters or added layers of interpretations. 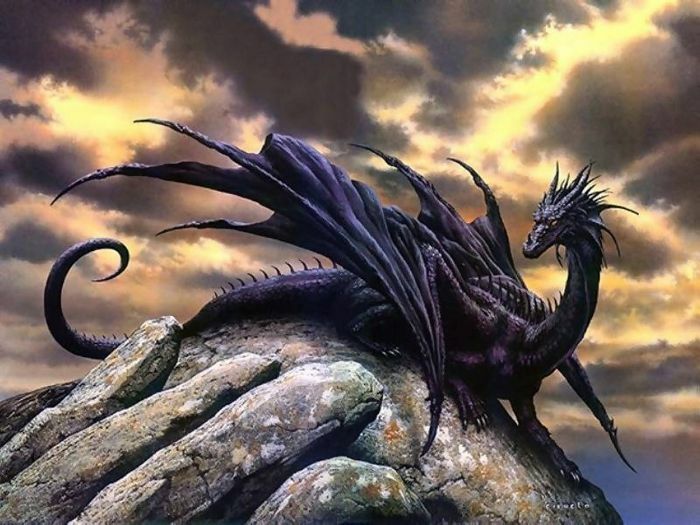 After you have connected with your feelings and the Concepts Dragon has lost his hold on your consciousness, you are able to cross over a mountain pass to the other side of the peak. Here there are wide open views of a beautiful deep blue lake, with soft green meadows leading down to its shore. This is where you can begin to sense what Needs are linked with the feelings you have become aware of. Connecting to our needs can bring us deep inner peace and satisfaction, but as we wander down to the shores of the lake, the experience may be interrupted by the impatient Mr Fix-it Dragon getting in the way. His problem is that he is already looking straight past your needs to the outcome of the whole process. He wants to hustle you along the road, he is thinking about solutions and results, but you don’t even know for sure yet what the question is to which you want an answer. Ask the Mr Fix-it Dragon to wait – you will get to his business in due course – while you sit by the lake and meditate on the beauty of your needs. Maybe even plunge right in for a refreshing dip; these waters are calm and warm and are said to have special healing qualities! Finally as we return to the path and the world of daily life, we meet the fiery Demands Dragon, who blocks our way to a successful Request. 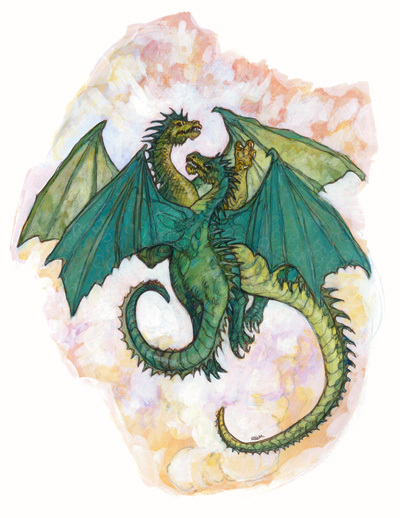 This dragon knows what he wants, but he’s not confident that there are many ways to get his needs met, so he focuses on one person or one way and expects them to deliver the result he wants – or else. Underneath, he’s scared of hearing a ‘No’, so he blusters. That way can lead to imposition or to rejection, because it doesn’t take account of other people’s needs. Instead of demanding, we can choose to relax into the certainty that there are many ways to meet our needs and many beings in this universe who would be delighted to help us if we would only ask. Now we can make a specific, do-able request – and be happy to hear a ‘No’ as simply another chance to reframe it. At this point all the dragons are calm and we are sufficiently in touch with ourselves that we can begin to think about communicating with others! We are half way to dialogue. Next it will be our turn to listen.